Gold nuggets are rare. I think most of us know that. And that is true regardless of their size. Even a small 1-gram gold nugget can be pretty hard to find. 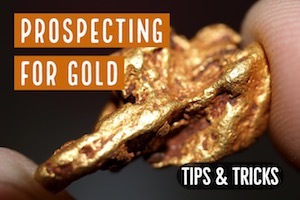 Many gold prospectors spend years before they ever find one. The thing is, most mining areas simply don’t produce big gold nuggets. Lots of areas, even if they are historically rich in gold, only have smaller gold dust. Finding chunkier nugget-sized gold is much harder. There are mining areas that have produced millions of dollars in gold, but not a single gold nugget! To find a big nugget, you need to search in places where they have been found in the past. The single best tool to find them is a metal detector. 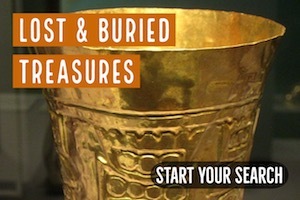 There are lots of metal detectors on the market today that will find gold. If you want to find a TROPHY NUGGET, a RETIREMENT NUGGET, a gold nugget that you will be talking about for the rest of your life, it will take some work. And you will need to hunt in the right places. Here are 19 places where huge gold nuggets have been found in the past, and there are undoubtedly still a few more left to be found. Ganes Creek gained popularity for a pay-to-mine operation that was there for many years. For a few thousand bucks, miners from all around the world would come and metal detect in the tailing piles for an opportunity to find big gold nuggets that were lost by the bucket dredges. There were many large nuggets weighing several pound discovered here. Unfortunately the pay-to-mine operation is no longer there, although active mining is still taking place. Mores Creek was another pay-to-mine operation in Alaska. Just like at Ganes Creek, miners could prospect here for a shot at some big gold nuggets and specimen gold. This operation isn’t running anymore either, but there still some big gold hidden in those tailing piles. Some of Alaska’s largest gold nuggets have come from Nolan Creek in the northern Brooks Range. This is a remote area, but there are active mines up here recovering some amazing gold nuggets. 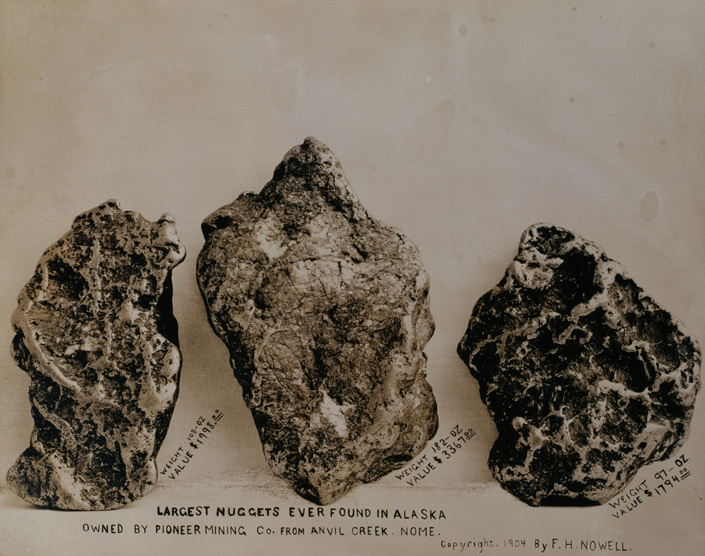 Anvil Creek near Nome is the place where some of Alaska’s biggest nuggets have been discovered. It’s interesting that the beach placers at Nome’s beaches get more attention than the massive nuggets that were mined at Anvil Creek. An 182-ounce nugget was found here! Rich Hill is near Stanton, Arizona. There were some exceptional gold nuggets found here. The biggest came from a mine on the top of the hill called the Potato Patch, which produced some real lunkers. This area is heavily claimed, but you might be able to join some of the local prospecting clubs in the area and get access to some good ground. 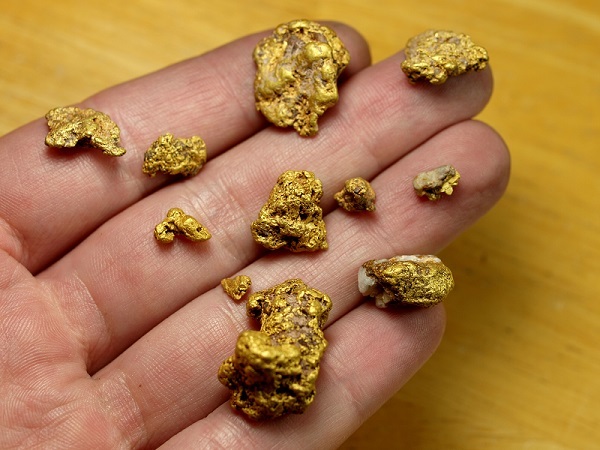 A handful of Arizona gold nuggets. Big chunky gold like this is frequently found in the desert around Wickenburg. In central Arizona, the San Domingo placers were some of the richest places to hunt. The Vulture Mine was Arizona’s largest gold producing mine. 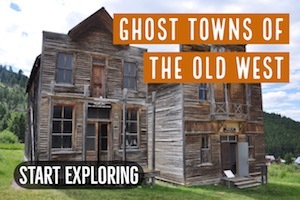 There are good nuggets to find in the gulches and dry washes all around Wickenburg. Some nice big nuggets have been found here. The Bradshaws are a very good place for prospecting in Arizona. This mountain range has lots of different areas to metal detect for gold nuggets. The goldfields are very widespread, and prospectors are still finding good gold today. The trick here is to learn the geology of the areas, as there are some natural indicators that will help you in your search. Atlin is an area that lots of miners don’t even know about. It is in the farthest reaches of northern British Columbia. The Atlin Mining District is notorious for kicking out some big gold nuggets. Lots of them contain a fair amount of quartz matrix. This is primarily a placer mining district, and a lot of the best specimens are found in old tailing piles. The gold is a bit lower in purity than some areas, but the potential for big nuggets makes it worth checking out. It’s no secret that the American River, the site of California’s first major gold discovery, has some big gold. In reality, any of the gold-bearing rivers in the Sierra Nevada Mountains could produce a big nugget. The Butte Nugget was found a few years ago in Butte County, California near the Feather River. It was over 5-pounds and found with a metal detector. There has been a lot of mining along the Klamath River in far northern California. This was a famous dredging river that has kicked out some whopper nuggets over the years. 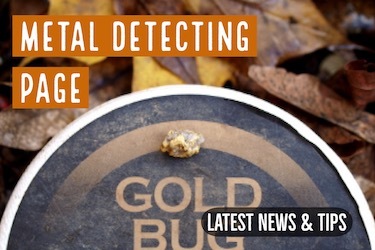 The dredging ban has certainly reduced the amount of gold being found here in recent years, but prospectors with metal detectors still make some impressive finds from time to time. One of the better places in southern California to search for gold is the Dale District near 29 Palms. There are undiscovered gold nuggets in this desert, and the area is so big and open that there are undoubtedly some undiscovered gold deposits out there. This is yet another of California’s famous gold-bearing river. The river and most of its tributaries are worth prospecting. There were also some big hydraulic mines that operated along the Yuba. These were sloppy and crude methods of mining, and they missed some gold. The Round Mountain Mine is worth mentioning simply because it has indeed been a major gold producer. 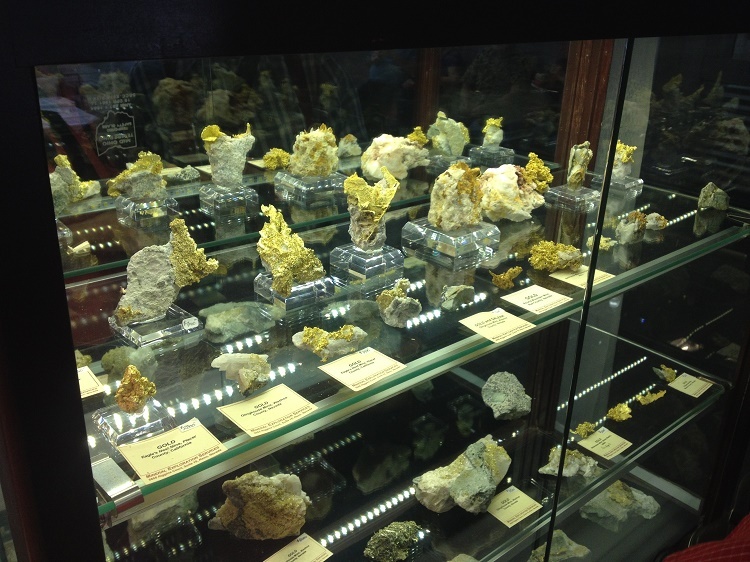 If you go to any of the big gem shows in Arizona, you will see some huge chunks of gold for sale that were mined from Round Mountain. They often have amazing crystalline structure. Unfortunately this is an active mine and isn’t open for casual prospectors. Perhaps some nice nuggets could be found in the surrounding area? Nugget hunters have long been attracted to Northern Nevada, particularly toward Pershing and Humboldt Counties. Elko County also has some good areas to prospect. There is an abundance of open ground to metal detect for nuggets in Northern Nevada. A person can wander for miles and miles swinging their detector. There are some pretty good chunks of gold scattered around that desert too. The Blue Mountains are in Eastern Oregon. The gold belt runs for nearly 100 miles, spanning from the town of Canyon City all the way to the Idaho border. 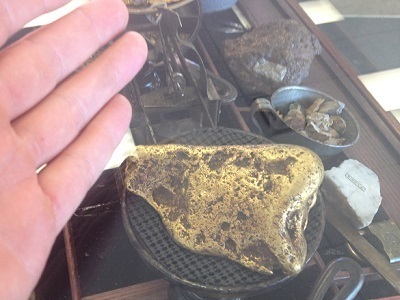 The largest nugget found here was the Armstrong Nugget weighing 84 troy ounces. Althouse Creek produced the largest nuggets in Oregon. It is a tributary to the Illinois River with headwaters that start near the California border. The largest nugget ever found here was reportedly 17-pounds! Other nuggets weighing several pounds have been found here. It is an exceptionally rich area in Josephine County. Much like Althouse Creek, there were many big nuggets that were mined from the Illinois River during the height of the Southern Oregon Gold Rush. Washington isn’t particularly well-known for having big gold, but the mines at Liberty are the exception. If you visit this town, you will see a kiosk downtown that claims nuggets weighing 70-ounces have been mined here. Countless other chunky gold nuggets have been unearthed. 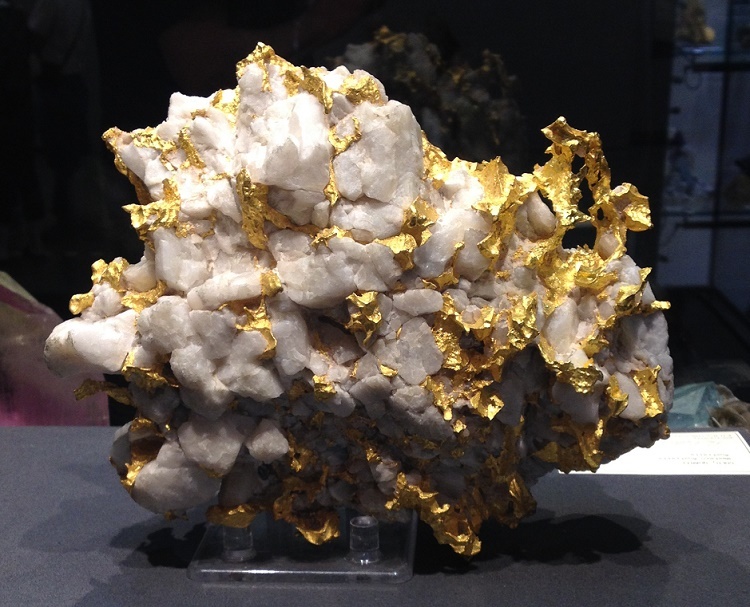 There are also some really neat crystalline gold specimens that have been found at the mines of Liberty. Some of them have very wirey structure and are highly collectable. Prospectors dig for gold nuggets in Liberty, Washington. Any mining method has the potential to result in a big gold nugget, but these days it seems like metal detectors are the tool of choice. Metal detectors allow you to cover a lot of ground, scanning old mines and tailing piles in search of nuggets that were missed by the old-timers. Many of the biggest nuggets were recovered by old placer mining methods like dredging and hydraulic mining, but these methods aren’t legal anymore. 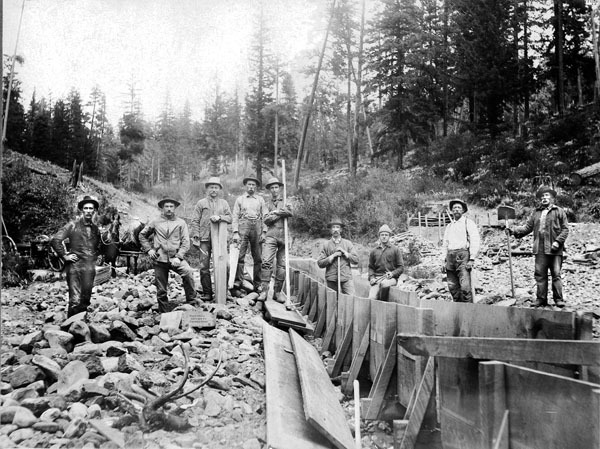 They moved a lot of material, but placer mining today is much different than it was in the 1800’s. 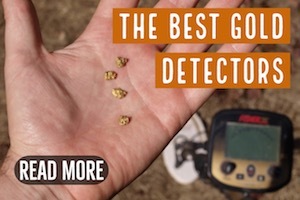 With a metal detector, you can find gold nuggets with very little impact on your surroundings. 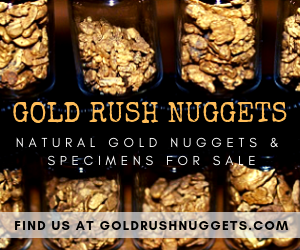 If you are serious about finding a big gold nugget, they you will need to get a good gold detector and start hunting! If you hunt one of the areas mentioned above, you might just get lucky and find the nugget of a lifetime! Next: A Gold Prospector’s Dilemma – Rework Old Patches or Find New Ground?